← HIGHLY RECOMMENDED: Biltmore Cabernet Sauvignon, American (69% California, 31% North Carolina), NV. * 13.9% alcohol. $14.99 on the Biltmore Web site; $11.99 at our local ABC store. We live on a farm. Recently, after a long, hot Florida day that included five hours of mowing, I wanted something refreshing, cold, fortifying yet fun. And WOW, did I ever get it. 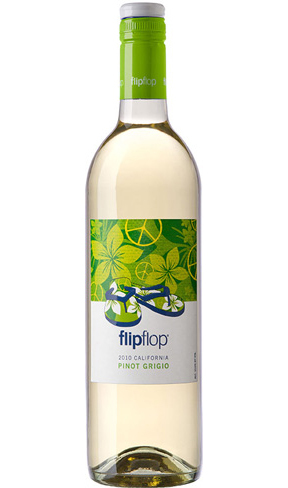 This unexpectedly huge wine, the Flipflop 2010 Pinot Grigio, is big, velvety, buttery, and creamy, like a Chardonnay, but a little more citrusy and a little sweeter. It has a pleasantly silky mouth-feel. And get this: it didn’t suffer at all as it warmed. With many whites, one must quickly pour a little, get the bottle back into the cold, and limp along keeping the temp just right—not so with this one. Making a Pinot Grigio that’s rich and creamy like this takes knowledge and skill. Most of them are thin and insignificant. Forget about any pretensions. The labels of these wines, especially the reds, are so bright they’re nearly fluorescent. (In fact, I didn’t expect to like the wine at all because of the lurid label.) However, the fact that the winery makes seven wines—and each label corresponds to one of the colors in the ROYGBIV rainbow—makes all the brightness interesting. As winemaker David Georges says, “We like to make seriously good wines, but not take ourselves too seriously in the process.” One thing is for sure: what’s inside this particular bottle of Pinot Grigio is seriously excellent. Their protests about seriousness aside, for each bottle sold, they donate a pair of flip-flops to the needy (visit www.Soles4Souls.com). David attended the University of California at Davis first to study viticulture (grape growing), but then decided to also study enology (winemaking) as well. He was mentored under Dr. Andy Walker, the world’s foremost vine and rootstock expert and graduated with a dual B.S. in both Viticulture and Enology. Soon after graduating, David’s perspective as viticulture-trained winemaker was put to great use at Codorníu (now Artesa), Davis Bynum Winery and Raymond Merlo Estate Vineyards, where he honed his winemaking skills. In 2009, David began working on wines that would become the inaugural vintage for flipflop, the newest brand in the Underdog Wine Merchants portfolio which covers the world with wines from the U.S., Spain, Australia, France, Italy, and more (visit http://underdogwinemerchants.com/). Oops, I almost forgot. The back label of Flipflop wines is useful. It includes a sweetness scale (this one’s rated between “Medium Dry” and “Medium Sweet”), suggested pairings, basic tasting notes, and serving/storing directions: “… store away from direct sunlight for up to 1 year.” That’s cool. This wine will attract “wine beginners” and the kind instructions to store wine away from light is definitely helpful. This entry was posted in California, Food, Pinot Grigio (Pinot Gris). Bookmark the permalink. Hey! Thank you so much for posting this great review about Flipflop Wines. We’re happy to see that you enjoy the product! Also, thanks for writing about Soles4Souls. We really appreciate your support! Love the pinot Noir,thats all i drink now. Best wine for the price. It actually is better than the more expensive wines I used to drink. Thank you so much for a great tasting wine at an even better price.